The Chaga Mushroom (Inonotus obliquus) is a fungus that is parasitic on Birch Trees, and can be found in Russia, Korea, Eastern and Northern Europe, Northern areas of the United States (like Michigan!) and Canada. It is sometimes called the clinker polypore, cinder conk, black mass and birch canker polypore. It is seen as a dark brown – black canker growing on the side of white or yellow Birch trees. It almost looks burnt or like a bad bug infestation. A giveaway is spotting some of the inner yellow flesh showing. It’s not soft like most mushrooms, but extremely hard like wood. This canker is not the fruiting body, but a mass of mycelium of the fungus. While there is no scientific consensus about it’s medicinal effects, some laboratory studies on an extract of Chaga mushroom have indicated potential for cancer therapy, immunotherapy, as an anti-inflamatory, and an an antioxidant.1 But if you want a personal testimony, I drank Chaga tea almost every day last winter and felt quite excellent! Of course it’s hard to separate variables that way, but try it yourself. 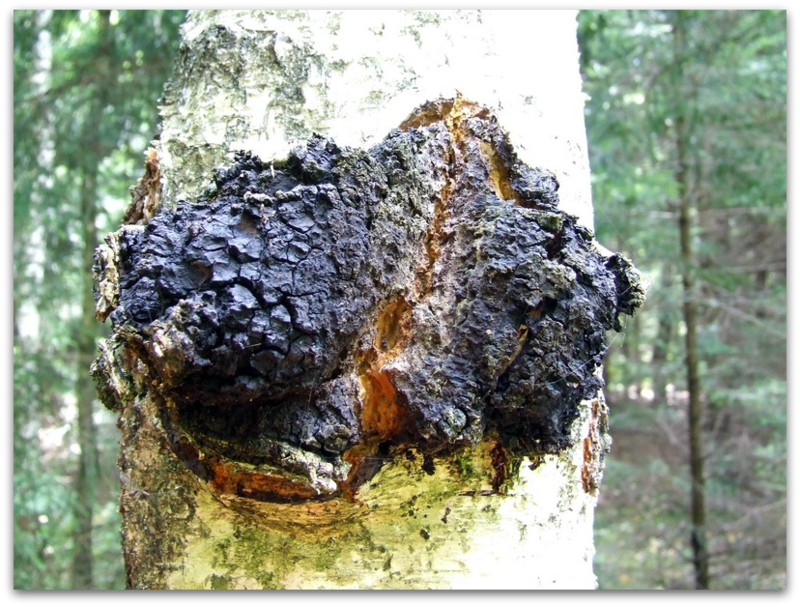 You will find Chaga on birch trees which tend to grow in moist wetland areas, usually alongside many Cedar trees here in Northern Michigan. Chaga mushrooms grow very slowly, but they do regrow on the same tree once removed so you could go back every four years or so to the same spot and continue harvest as long as no one else got there first! It’s best to just knock off the exterior portion of the growth with a hatchet or hammer, and not dig into the tree. This might damage the trees inner bark leading to the untimely demise of the tree, and no more Chaga for you. Chaga will kill the tree eventually, but it takes a very long time so proper harvesting practices are good all around. If there are many infections of Chaga on the tree then it might die within 4 to 5 years. Never harvest chaga from a dead tree, the fungus dies along with the tree. It’s also best not to harvest Chaga that are smaller than grapefruit size (about 7 to 10 pounds) but instead let them grow to full size. Later in winter is the best time to harvest Chaga, since the tree has gone dormant and the Chaga is at it’s peak for stored nutrients. During the spring and summer when the sap is flowing, nutrients get flushed out of the Chaga so don’t harvest while the sap is flowing. *If you are taking any medications, start with a small amount of Chaga tea because there may be interactions. First dry the the chaga. You can heat it for 24-48 hours at 110-125 degrees F, or leave in warm spot like on top of your water heater, or in a warm attic. Break off as much as you want to use, and pulverize it. We used the back of a hammer to break off a piece, then the front of the hammer to crush it up on a hard surface. Watch out because pieces will fly everywhere this way. You could also use a meat or coffee grinder or food processor. Place the powder into a pot of water and boil it for an hour, or until the water becomes very dark. Once cool, enjoy your Chaga tea! 1. Kim, Yong Ook; Han, Sang Bae; Lee, Hong Woen; Ahn, Hyo Jung; Yoon, Yeo Dae; Jung, Joon Ki; Kim, Hwan Mook; Shin, Chul Soo (2005). “Immuno-stimulating effect of the endo-polysaccharide produced by submerged culture of Inonotus obliquus”. Life Sciences 77(19): 2438–56. doi:10.1016/j.lfs.2005.02.023. PMID 15970296. 1. Kim, Yong Ook; Park, Hae Woong; Kim, Jong Hoon; Lee, Jae Young; Moon, Seong Hoon; Shin, Chul Soo (2006). “Anti-cancer effect and structural characterization of endo-polysaccharide from cultivated mycelia of Inonotus obliquus”. Life Sciences 79 (1): 72–80.doi:10.1016/j.lfs.2005.12.047. PMID 16458328. 1. Park, Young-Mi; Won, Jong-Heon; Kim, Yang-Hee; Choi, Jong-Won; Park, Hee-Juhn; Lee, Kyung-Tae (2005). “In vivo and in vitro anti-inflammatory and anti-nociceptive effects of the methanol extract of Inonotus obliquus”. Journal of Ethnopharmacology 101 (1–3): 120–8.doi:10.1016/j.jep.2005.04.003. PMID 15905055. 1. Mishra, Siddhartha Kumar; Kang, Ju-Hee; Kim, Dong-Kyu; Oh, Seung Hyun; Kim, Mi Kyung (2012). “Orally administered aqueous extract of Inonotus obliquus ameliorates acute inflammation in dextran sulfate sodium (DSS)-induced colitis in mice”. Journal of Ethnopharmacology 143 (2): 524–32. doi:10.1016/j.jep.2012.07.008. PMID 22819687. 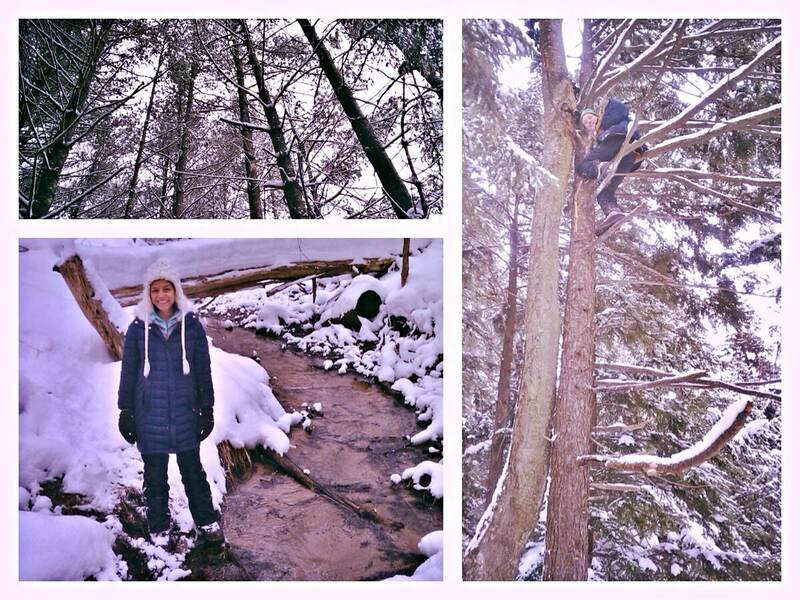 Hello, I live in western N.Y. and have 40 acres, there are many Birch trees on my land. I would love more info.on this awesome mushroom. Hope you can find a lot of Chaga on your acres! Nice article. 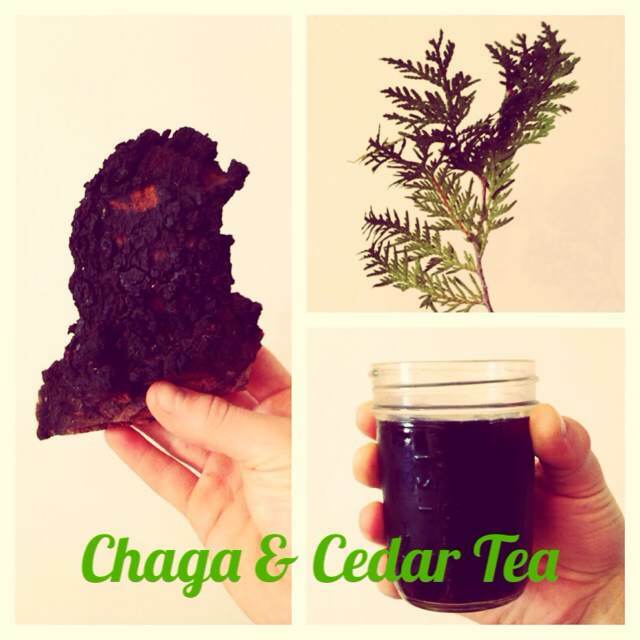 I have been a bit obsessed with Chaga ever since I learned about it. Funny, my husband has a collection of survival videos and they suggest using it for tinder…I about hit the ceiling and my husband got a nice earful why it is so much more than tinder. Thank you for sharing your journey and insights on how to pick the right mushroom. This is very educational.Thank you!